While North Carolina’s rural mountain residents were some of the last people in the state to receive household electricity service, the state’s first large-scale central electricity generation facility opened in 1940 along the border between Rutherford and Cleveland Counties to provide power to the heart of the state’s textile industry. Household energy expenditures in the Mountain Resources Commission (MRC) region averaged 5.6 percent of median household income – 13.7 percent higher than the state average of 4.9 percent of median household income. Henderson County households spent the most on energy, at $2,402 per household, followed by Transylvania County households at $2,342 and those in Polk County at $2,273 per household. 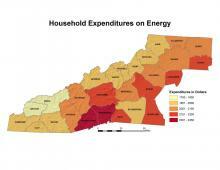 Household energy expenditures were $1,900 per household or less in Graham, Swain, Cherokee, and Avery Counties. 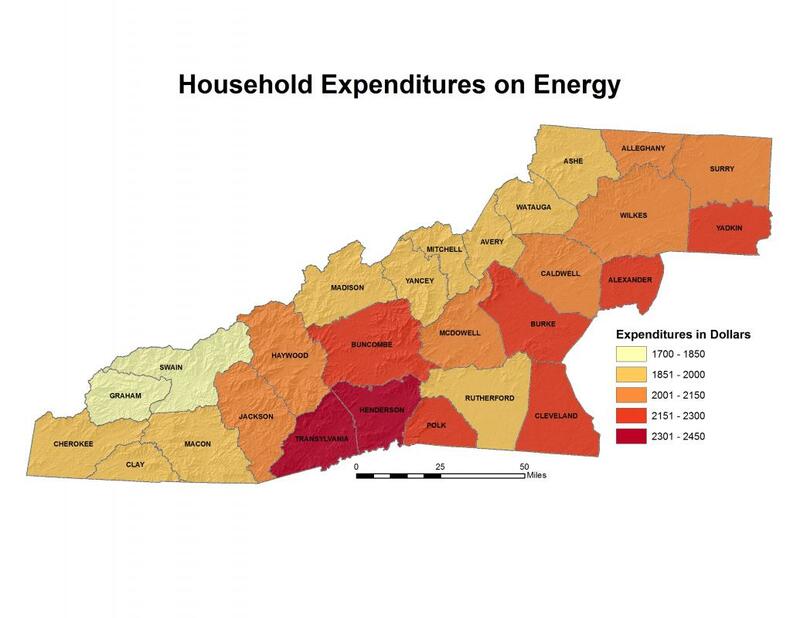 Energy expenditures represented 6 percent or more of median household income in Transylvania, Surry, Alleghany, Burke, and Caldwell Counties. Households located in the MRC counties are heated with a greater diversity of fuels than those in the state as a whole. While about 73 percent of households in North Carolina are heated with electricity or natural gas, in the MRC region 72 percent of households are heated with electricity or fuel oil. Twice as many households in the MRC region use wood or solar heating as do other areas across the state. Electric heating is most prevalent in Macon and Alexander Counties, with 61.5 percent and 58 percent share of households, respectively. Only 8.6 percent of households in Yancey County use electricity for heating, along with 15.5 percent in Mitchell County, 18.5 percent in Madison County, and 19 percent in Ashe and Avery Counties. Natural gas use by households for heating is most common in Henderson and Cleveland Counties, at about 26 percent, but less than one percent of households use natural gas for heating in 13 of the region’s 27 counties. Propane is most commonly used in Clay (43 percent) and McDowell (41 percent) Counties. Fuel oil is the heating fuel for 73 percent of households in Yancey County, 67 percent in Mitchell County, 62 percent in Ashe County, and 61 percent in Madison County.